How many parents give their children secondary control over their devices? I know I’m guilty of giving into prickly little fingers making their way over to wreck havoc on my Windows phone and iPod touch. So much that she ended up with her own. So your wondering how does a 4 year old get her own iPod Touch? Simple, it was handed down to her after that overly sensitive screen decided to take on a design of it’s own and we can imagine what that would be. Needless to say, she became owner of her own gadget which brings me to great applications for children. 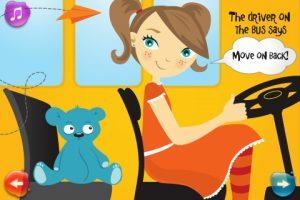 Every child and adult knows the lyrics to the wheels on the bus. Duck Duck Moose created a great interactive version of every children’s favorite song, well at least in my book! I love how the colors are so vibrant, words are included so you can teach your child how to read and of course how interactive it is from making the dogs bark, swishing the wipers to opening and closing the bus door. The song plays in 5 different languages English, Spanish, French, Italian, and German. And best of all you can even record your child singing to this ever so cute nursery rhyme. While I adore it, my daughter simply loves this application and plays it on her touch all the time.